A tea plantation in Tamil Nadu. 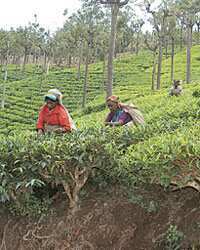 Kochi: The government plans to allow trade promotion bodies representing commodities such as tea, coffee, rubber and spices to float plantation development bonds for generating funds to create infrastructure. The group of ministers (GoM), which met in New Delhi on Wednesday, discussed various recommendations of the Rangachary report that looked into the plantation sector and approved the proposal. The task force on plantation, headed by former Central Board of Direct Taxes and Insurance Regulatory Development Authority chairmanN. Rangachary, submitted the report early this year. Other members of the task force were Vijay Kelkar, Subhashish Gangopadhyay, Bharat Ramaswamy and A. Damodaran. Jairam Ramesh, minister of state for commerce, said about Rs1,400 crore worth of bonds would be raised for infrastructure development, which would include the establishment of various common facilities for manufacturing and processing units. After the cabinet approval, the proposal will be put in the 2008-09 Budget. GoM said the bonds, with a seven-year maturity, should be given the status of approved government securities. Among other recommendations of the plantation panel approved by GoM is a crop insurance scheme for tea, rubber, coffee, tobacco and spices. The outlay for this would be around Rs729 crore for a five-year period—Rs500 crore would come from the government as budgetary support and the rest would be takenfrom the price stabilization fund (PSF) being collected from the growers. According to Ramesh, there would be a 50% subsidy for the growers with land holdings up to 10ha and 25% subsidy for those with land holdings between 10ha and 50ha. The scheme would apply only to growers who are members of the PSF trust. The one-time membership fee for the trust would be Rs100 for growers with land up to 4ha and Rs500 for those with higher land holdings. The insurance scheme would be implemented by different commodity boards and serviced by the Agriculture Insurance Co. of India Ltd.
GoM also decided to extend the personal accident insurance cover to spice growers and permanent plantation workers. Until now, the cover was available only to growers and workers in tea, coffee, tobacco and rubber sectors. The cover will now be available to landowners of up to 4ha. A Rs1 lakh payout is available for death or permanent disability.